Curb appeal is a lot more than just whether your lawn is trimmed. Today’s buyer is looking at everything: modern exterior doors, gardening, landscaping, and anything else that might add up to continued maintenance. If the home is presented nicely, and looks easy to maintain, it works in your favor. Here are some tips you can use to help boost the curb appeal of your home. In drier parts of the country, especially in California and all throughout the Southwest, drought-conscious landscaping is in higher demand. So-called xeriscaping is excellent for reducing the costs of watering your lawn, and these types of yards don’t need much upkeep to make them look nice. Paired with modern entry doors and nearly any home looks like it got a futuristic boost. Don’t fill your yard with dirt and rocks, but do look for colorful succulents and shrubs you can place around the rims of the home. You can also plant trees, depending on how water-reliant they are. Even if you’re planting for the purposes of xeriscaping, check with a gardener to see if it’s wise to remove your sprinkler’s altogether. The garage and front doors are the most common access points in the house, and one of the first things a new buyer will notice. 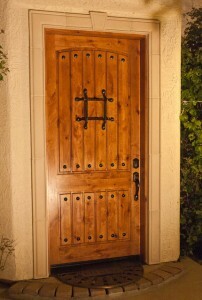 Fortunately, upgrading both to modern exterior doors will usually provide some corresponding boost in home value. If you can, upgrade to wood doors. They look more attractive than their fiberglass counterparts, and they offer better insulation to the home too.